I love thinking about the future of work. And recently there’s been a lot of discussion that the future of work means bigger companies employing less people. It’s hard to draw any other conclusion when you look at deals like the Facebook acquisition of WhatsApp, a US$19 billion dollar acquisition with just 55 employees. I’ll save you pulling out the calculator – Facebook are paying an incredible $350m or so per employee! I wanted to understand the Australian perspective on whether we’re seeing the start of a major disconnect between employees and firm value. To do this we’ve spent some time running the numbers on the ASX 100. And the results might surprise you! I’m just looking at the ASX 100 here. But that’s a pretty good representative sample, given that these 100 largest companies in Australia employ between them about 1.4m people. At an aggregate level, these 100 companies are worth just over 1.4 trillion dollars (yes, with a T!). 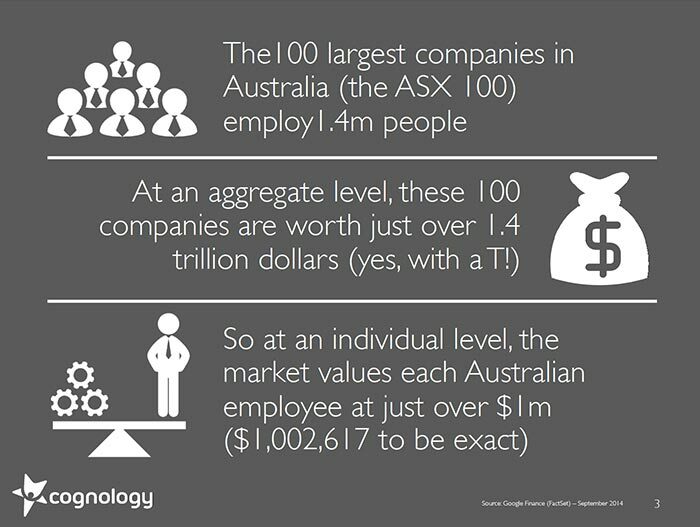 So at an individual level, that means that the market values each Australian employee at just over $1m ($1,002,617 to be exact). Roughly that means that a company worth $100m will on average have about 100 employees. A company worth $10b will have about 10,000 employees (and so on). Before you go asking your boss for a pay rise, it’s worth considering that this average masks some big differences. So of course I put together a top 10. And my vox-pop around the office shows that pretty much no one can guess which large Australian company has the most valuable employees. I’ll save the suspense. Australia’s most valuable employees work at Transurban – the tollway giant that operates some of Australia’s most important highways. 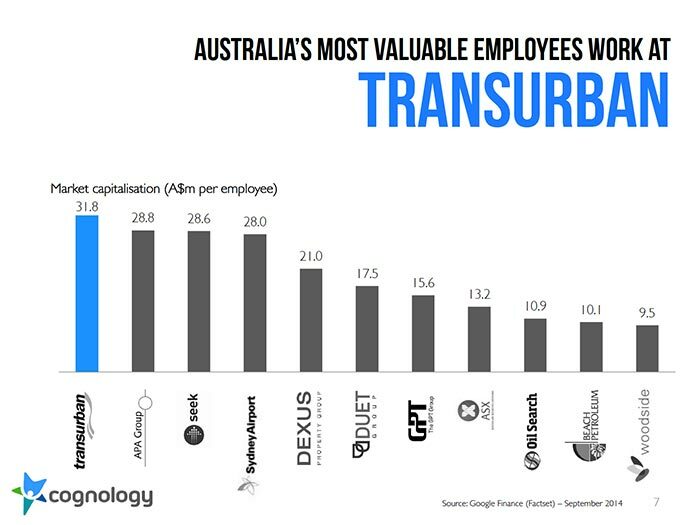 A single employee at Transurban is worth nearly A$32 million dollars. The startling fact here is that depending on which day you look at the exchange rate, that’s more per employee than Facebook! (Their average employee value is a measly US$28 million). It’s also significantly more than Apple, Google, Amazon and Microsoft. The rest of the Australian top 10 comprises APA Group (pipelines), Seek, Sydney Airport, Dexus (property), Duet (infrastructure), GPT (property), ASX (the stock exchange), Oil Search, Beach Petroleum and Woodside Petroleum. Surprisingly, Seek is the only technology company to make the top 10. In Australia, it’s not technology, but tollways that win out in this list. 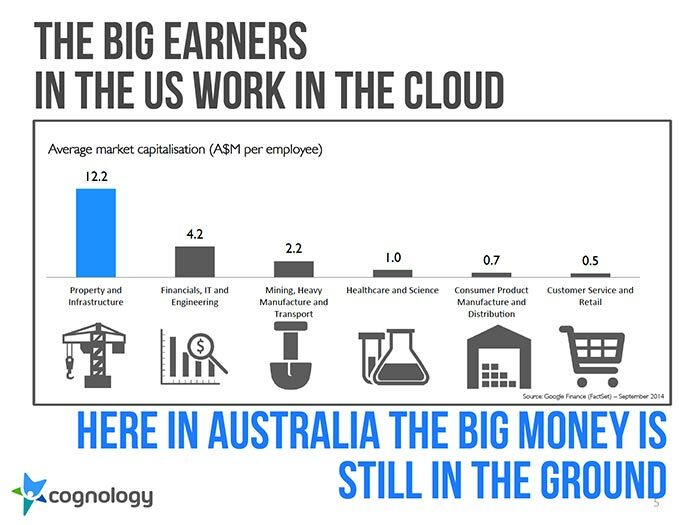 The big earners in the US work in the cloud. Here in Australia the big money is still in the ground. On a sector-by-sector basis, it’s not surprising that the most valuable employees sit in property and infrastructure. Long term monopoly contracts and regulation mean that there’s simply less employees required to generate earnings. But what’s startling is just how significant the difference is between industries, with property and infrastructure employees worth nearly 3x more than the next most valuable sector. The difference between Australia’s most valuable and least valuable employees is HUGE! The great thing about the stock market is it doesn’t mess about with niceties. 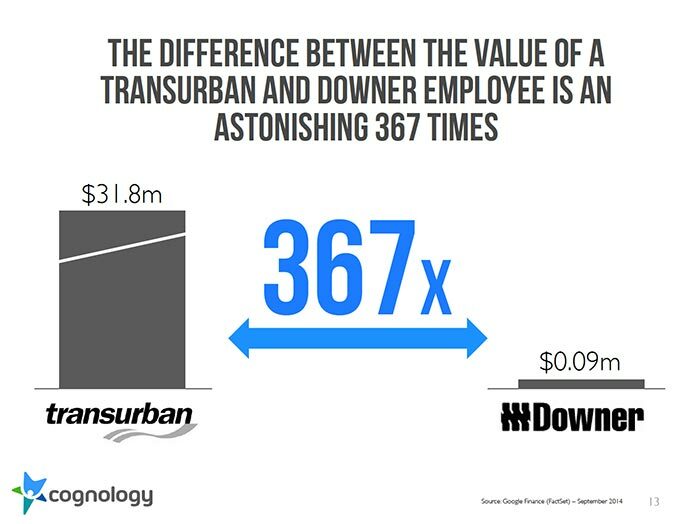 Between Australia’s most valuable employees (Transurban) and least valuable employees (Downer) there’s a difference of 367 times! 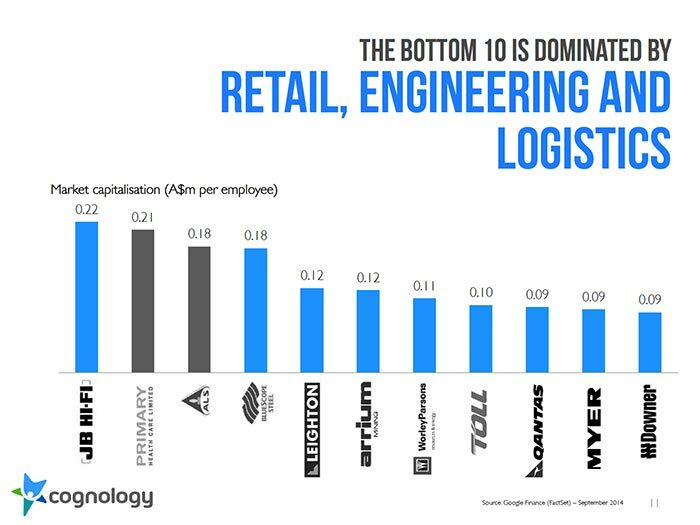 As well as this astoundingly large multiple, what’s interesting here is that the bottom 10 companies in this list are all subject to market and technological disruption. We’ve got a collection of steel makers (Bluescope and Arrium), retailers (JBHifi and Myer), logistics companies (Qantas and Toll) and engineering firms (ALS, Leighton, Worley and Downer). Given the dominance of infrastructure players in the top 10, do Australia’s most valuable companies rely on regulation, rather than innovation? Where are the technology companies? There’s a lot of talk get’s thrown around in the press about how Australian investors just don’t understand and value technology. This research provides some hard evidence in support of this claim. Many people have predicted that the future of work means larger companies employing fewer people. On the basis of this data I think we can say that the future of work will also be more and more unequal (with the gap between the most and least valuable continuing to increase). I’m also looking forward to tracking these stats over time to see if the average Australian employee is getting more or less valuable. We’ll update this on a semi-regular basis to keep track. There’s so many other insights to be had here, so make sure you stay tuned to the Cognology blog over coming weeks as we look in more depth at key industries and companies. But I’d also love to hear from you. What does this data tell you about the Australian workforce and the future of work? These numbers are based on Google Finance data as at late September 2014. This was supplemented with WGEA data where necessary (some companies are quite tricky about hiding how many employees they have). https://www.cognology.com.au/wp-content/uploads/2014/10/Australias-most-valuable-employees.gif 210 210 Jon Windust https://www.cognology.com.au/wp-content/uploads/2017/01/Cognology-logo-colour-300x101.png Jon Windust2014-10-27 00:44:382015-06-05 02:02:58Who are Australia’s most valuable employees? I get told all the time that talent management sounds like HR speak. That executives don’t believe it has substance behind the buzzwords. But have you ever been caught saying “Our people are our most important asset”? Or uttered “You can only manage what you can measure”? I think both are fantastic statements on management. And let’s face it, we’ve all probably said both at some stage. To really understand what talent management means is just to understand these two quotes. Don’t get caught up on the buzzwords. 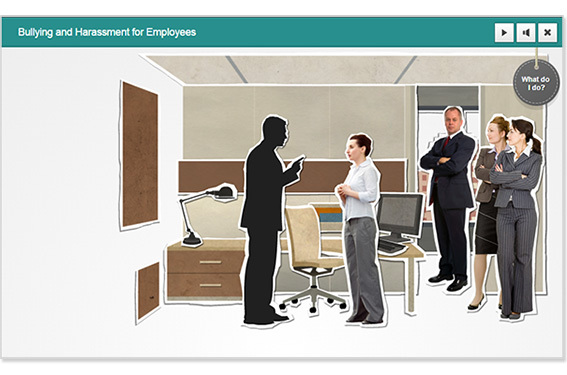 ManpowerGroup conducts an annual survey on executive attitudes towards talent management. Over 37,000 employers were queried about their talent management challenges. You can find the results here. Only 40% of senior management ‘get’ the connection between talent management and the impact on business. And only half of respondents feel ‘somewhat confident’ their talent management strategies are paying off. Can you imagine if a survey said the same about the accounting function? Or finance? Or sales? In a well-run business talent management is as critical as the accounting function. But clearly this isn’t the way that many executives see it today. Far too often, talent management isn’t seen as business critical. It’s perceived as something that we do in HR to keep ourselves busy. When talent management is just a HR responsibility, you hear statements like those above. In these businesses, managers typically fail to make the connection between measuring your talent today and delivering on your business plan next year. They don’t understand just how quickly a ‘soft’ competency gap translates into a ‘hard’ profit miss. The other issue that arises is a real misalignment around skills and competencies. Regardless of how good your business partners are, there’s no substitute for your operational managers engaging in the process. There’s such a difference in new hire success when managers set out exactly what the skill requirements are in their own words. If a team misses their budget, we don’t blame accounting. In the same way, if a team doesn’t have the talent they need to succeed, we can’t blame HR. At its core, talent management is an operational responsibility. It’s essential strategy work that every manager needs to be doing. As I’ve written about previously, we’re facing a serious talent crunch. And it’s going to hit Australian businesses hard. Don’t let yourself get caught. Make sure you’ve quantified the talent you have, the talent you need, and the talent you’re going to have to grow. 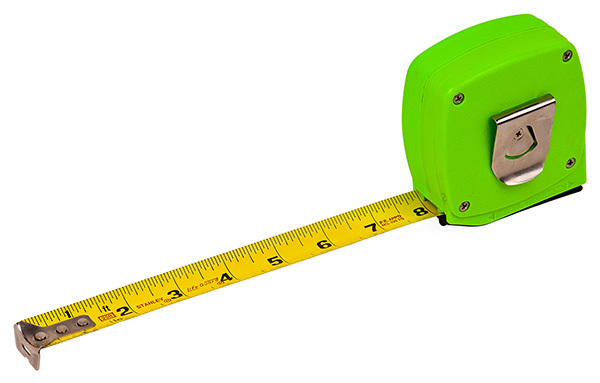 How have you been able to convince your senior management team on the value of talent measurement? I’d love it if you could share your tips below. This month Cognology has teamed up with e3Learning to give its clients instant access to a full range of cost effective online learning course content. Workplace safety including Warehouse Staff Manual Handling and First Aid. Online content can also be tailored to suit individual clients. The e3Learning library integrates seamlessly with Cognology’s Learning Management System. Accessing content is just a flick of a switch. For clients wanting to manage compliance, courses can be scheduled for re-certification on a periodic basis. e3Learning started out in 2001 with a number of core compliance courses and a small team of expert web developers. Since its humble beginnings, e3Learning has experienced substantial growth and are now a leader in commercial eLearning. In 2013, they were named as one of Australia’s fastest growing companies in BRW’s Fast 100 List. In the same year, e3Learning became part of Open Universities Australia (OUA), owned by seven of Australia’s premier universities, and the national leader in quality online tertiary education. On top of that, e3Learning has worked with some of the biggest names around the country; including Amcor, Cadbury and Rio Tinto, just to name a few. Further information can be obtained by emailing [email protected] or by visiting our Contact Us page. 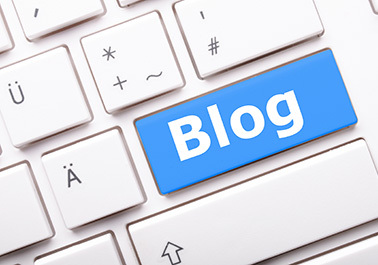 If you’re a HR blogger and would like to reach a large Australian audience interested in talent and performance management, then this is your guest blogging opportunity. 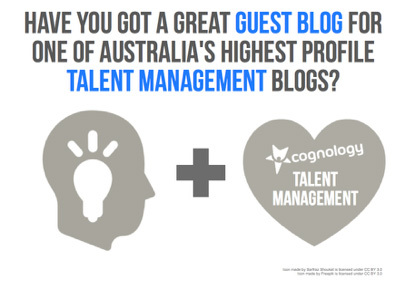 The Cognology blog is a great opportunity to reach a large Australian audience of HR and talent professionals. Every month we reach c.10,000 unique monthly viewers, so it’s a great platform to increase your profile in the space. We’d love to see interesting and edgy submissions that touch on all areas relevant to talent and performance management. You definitely don’t need to be a published or recognised author. Your experience and passion in the space is enough! Interested? Send a short pitch describing what you’d like to write about to [email protected]. We’ll get back to you within 72 hours letting you know if it’s a good fit. That easy! So it’s official. We’re at peak millennial. There’s never been more articles written about how millennials are ‘transforming the workplace’. But here’s the catch. Just about everything I’ve read on how millennials are ‘reshaping the workplace’ is complete rubbish. 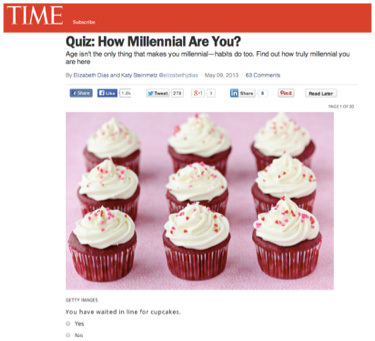 Are you a Millennial basher? In making a generalisation about millennials, it’s worth starting by asking whether the same statement could be made about the rest of the workforce. I’m not joking. This is really a headline in “breaking news”. And for me, it’s one of the best illustrations that people are just using the “millennials” trend to repackage universal truths about work. Because really, who doesn’t want money without the hard work? We do need to reshape the workforce. But for everyone, not just millennials. I agree with most of these statements. But only when you exclude the brackets. We do need to radically reshape the way we work. But we don’t need to just do it for millenials. We need to do it for everyone. There’s a number of big reasons that we need to reshape the work. We need to reshape work because we’re facing a productivity crisis. We need to reshape work because knowledge work has never been more complex. We need to reshape work because input and output have never been more disconnected. And we need to reshape work because technology is rapidly redefining what work can be. But all of these reasons affect the entire workforce. And yes, these trends are accelerating at the same time as millennials are joining the workforce. 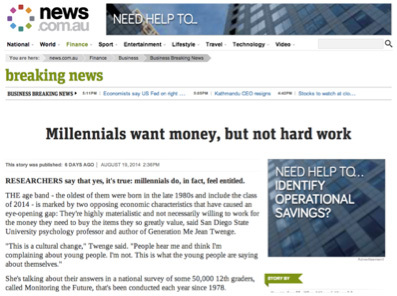 But they are not happening because millennials are joining the workforce. As my Statistics 101 lecturer from many years ago would remind us all: Correlation does not equal causation. We do need to have hard conversations about the future of work. But reshaping the workplace isn’t going to happen whilst we’re caught up on the millennials bandwagon. They’ve arrived at the party at the right time. But the future of work is a conversation for all of us. A Google search for “best HR blogs” or “best talent management blogs” will get you thousands of great resources. But frustratingly most of the top results tend to be very US focused. So I wanted to take some time to shine a light on some of my favourite local thinkers in the space. Over the past couple of weeks, I’ve put together my list of the top five Australian and New Zealand blogs in and around talent management. To do this, I’ve focused on blogs that are regularly updated, contained innovative and engaging advice and have a regular local focus. Daniel Lock is an expert in change management and productivity. I love his weekly posts on the latest news in change management, HR and technology. Every week Daniel collects a series of great links to big news on how technology is changing business. Daniel’s recent pieces on developing change and overcoming complacency were also great. He does an excellent job at addressing the eternal paradox of needing change to get ahead but being comfortable in our current surroundings. Dan is quite active on social media, you can find him on just about every platform. I’m sure he’d love you to touch base. Con Sotidis is an expert in organisational learning and development. Con started his blog earlier this year, armed only with his (many) years of experience in the public sector and a passion for L&D. Not all Con’s posts are strictly L&D based (although MOOCs do pop up a fair bit). He recently posted a fascinating article on where L&D should sit in relation to human resources. I agree with Con that L&D (as well as HR) should sit as close to the business as possible. Get to Con’s blog, and learn a thing or two about learning! Greg Savage is your go-to man for all things recruitment. Greg’s a real veteran in the blog space, having shared his insights with the world for many years now. He recently wrote a fascinating piece on the way we should look at recruitment and talent acquisition. Greg makes a great argument that we should look at potential candidates more like consumers. As a result, it’s critical to know their intention as well as grabbing their attention. Give Greg’s blog a read to understand more about recruiting for the future of work. Richard Westney is another HR expert from across the Tasman with a regularly updated blog full of great HR insights. You’ll find everything on Westney’s blog from “the tyranny of turnover” to “CEO’s prefer blondes”. HR Man NZ is a blog full of insight into how to stay progressive and avoid getting bogged down in unnecessary process. Break the frame is a great blog on leadership, career advice and life from Alli Polin. Alli lives smack bang in the middle of Australia in Alice Springs. She’s a consultant with the corporate experience to back it up, using her knowledge as an executive to coach other likeminded individuals. Alli gives regular advice on how to give leaders feedback (Spoiler alert: the answer is honesty) or how to use journals as a more productive use of your reflective process. Alli’s expert advice is just as applicable in the red centre as it is in any part of the world. Her recent blog on “how to work with someone you hate” was a great piece on managing conflict… Because I’m sure you’ve had to work with someone you can’t stand (just like everyone else).